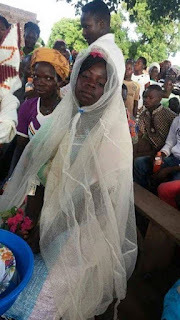 Photos of a bride wearing mosquito net and rice bag as weeding gown has stormed the internet. Its a pity how poverty has eaten deep into the lives of people to go ahead and take this ridiculous step. 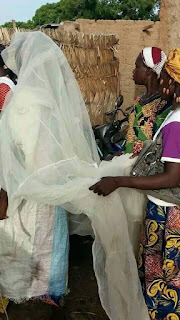 The bride is seen wearing her wedding gown and being accompanied by the best lady. Extremely hilarious.